As Rajasthan gears up for festival season, embrace the Tirth Raj (meaning ‘king of them all’), at the annual Pushkar Camel Fair 9th-17 th November 2013. 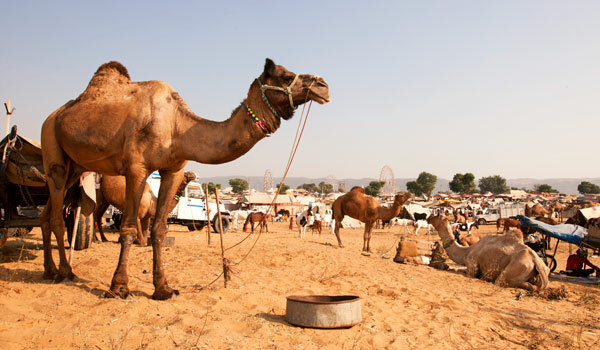 One of India’s most popular annual festivals, and one of the world’s largest camel fairs, the Pushkar Camel Fair attracts around 300,000 people to the outskirts of the Thar Desert in Rajasthan every year. Tourists, traders and buyers descend on Pushkar in search of a bargain, to watch the races, or simply to soak up the festive atmosphere. 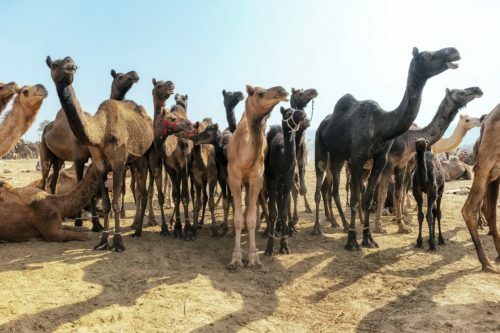 In the days leading up to the fair, and for a few days afterwards, the roads leading to Pushkar are packed with camels being ushered around the sand dunes and back home again – a truly magnificent spectacle. 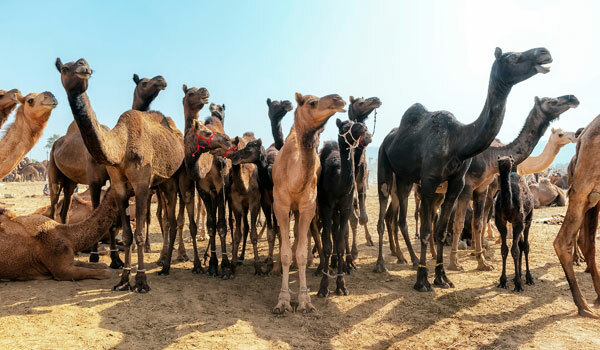 In addition to the 20,000 camels, cattle and horses in attendance, farmers, traders and snake charmers from all over Rajasthan gather to take part in the fair, as well as enjoy a myriad of events on offer in the Mela Ground. 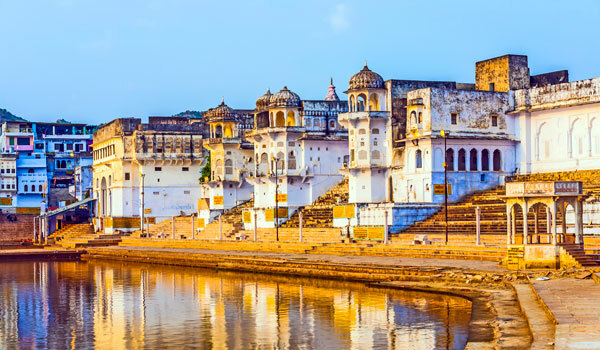 Situated on the banks of Pushkar Lake, the festival’s many events include traditional rural sports, Tug-of-War, turban and moustache competitions, and a cricket game that invites foreigners to challenge the local Pushkar club, as well as the obligatory horse and camel races. While camels are for sale, they’re also paraded in elaborate and festive costumes. Some are even shaved and entered into beauty contests. Those seeking a colorful souvenir from the festivities should explore the Fair’s numerous stalls, which are bursting with vibrant textiles, statement jewellery pieces, and traditional Rajasthani clothing – the display is a chaotic swirl of colors and sounds. Local women, wearing bright clothes and glimmering jewellery, also perform traditional dances to officially sanction the fair’s events. The Pushkar Camel Fair coincides with the night of the Full Moon, Kartik Purnima, during which time thousands of pilgrims bathe in the holy Pushkar Lake and enact other devotional rituals to honour the Hindu god Brahma. 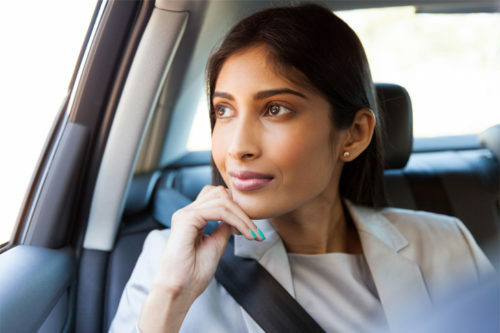 We would recommend staying at Pushkar Resorts, although not in the center of Pushkar, it is about 8km away, the hotel is comfortable and elegant and an oasis of calm amidst the madness of the Fai. Situated on an expansive, 15-acre estate on the outskirts of Pushkar, the resort houses guests in individual verandha’d cottages overlooking the lush, green gardens where peacocks lackadaisically stroll. A dip in the hotel’s swimming pool is also an enjoyable way to wash off the layers of dust accumulated during the festivities – if that fails, there’s always the on-site Kaivalya Spa. Pushkar Resorts also has a wonderful restaurant on the premises, run by Chef Rawat it serves up fine Rajasthani favorites. If the Camel Fair is not enough excitement ask the hotel to arrange a desert cycle tour, a hike up to the Savitri Brahmin Temple perched on top of Ratnigiri hills, or a shopping trip for marble pieces and miniature paintings in Pisangan Fort in nearby Kishangarh. 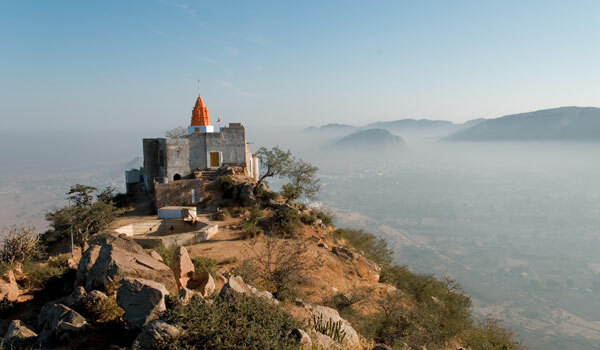 Getting There – Pushkar is a 6 hour drive from Delhi via Jaipur / 2.5 hours from Lakshman Sagar, Pali. All major train routes serve Ajmer located 13 km from Pushkar, from Delhi via Jaipur. Rajasthan is an beautiful region full of culture and life, if you would like to find further information you can view our itineraries, from family tours to understanding the essence of Rajasthan.